I wanted to ask for prayer for a friend. She has been on my mind all week and non-stop this morning. She may be losing her mom today. My heart is breaking for her. She is so young to be losing her mom already and it is their kids only grandmother. Please pray that God comforts her and her father as they go through this and that He gives them strength. Also, pray for a miracle. I know God can heal her mother and amaze the doctors if it is His will. I am praying for that as well. They will see her again one day and I am so thankful for that, but it is still hard for us that are left behind. We still have to go on with our life while feeling such a loss. I love you Wendy. I’m sorry you are going through this and wish I could take your pain away. UPDATE: Wendy’s mom is with Jesus now. Please pray for her and her family. I probably shouldn’t be writing this post. I barely slept last night so I’m pretty grumpy. lol! But, I need to remember what was going on 4 weeks post-op. In 2 days it will be 4 weeks since my reconstruction surgery. Not sure what was wrong with Kevan last night, but he snored louder than he ever has and he stopped breathing numerous times. He was going to sleep on his cot in the office (we aren’t at home) and before I went to bed I said, “I didn’t get married so you’d sleep somewhere else! Sleep with me.” He’s so warm too. I wanted him next to me. Then, after he came to bed I wished I hadn’t said it and I wanted to wake him up and tell him to go sleep on his cot. lol! I never did though. I prayed from midnight to 3am that he would stop snoring. He finally did. I fell asleep, but I was worrying and it wasn’t a good sleep. I was worrying about my dumb drain and getting it out today. I had a feeling things wouldn’t work out in my favor. I STILL HAVE MY DRAIN! UGH!!!!!!!! I was supposed to get it out today, but it went up last night. We drove into Nashville last night and stayed with my MIL hoping I would be getting it out at my appointment today, but nope. Grrr! It has to be UNDER 5cc’s for 3 days. The last 4 days have been 5, 5, 5 and then 6.5! Really? It has to go up?? I’m so sad. I want this thing out of me. I understand it is doing good and I need it there because I have 3 less lymph nodes on that side and I don’t want an infection, but I’m so tired of it. I’m tired of the pain of having it, trying to hide it in my clothes, having to empty it twice a day and trying to sleep with it attached to me. I talked to the nurse this morning and she confirmed that it cannot be 5cc’s. It has to be UNDER 5cc’s for 3 days. I have an appointment on Thursday and she didn’t think I would make that one either since it went up last night. Still having the bruising pain from the lyposuction they had to do on my stomach. It doesn’t hurt unless my stomach gets bumped or if I’m taking my clothes on/off. But, when it does….it HURTS! My stomach doesn’t look any smaller and I am under the impression at this point that lypo is not worth it! lol! Although, they didn’t take much…just enough to help fill in areas in my breast that needed it. It hurts for weeks and I have to wear a belly band still. Although, they let me change to a Spanx, but since I’m not allowed to pull with my arms I have to have Kevan help me put it on. Since he can’t come with me into public restrooms this becomes a problem since it is a one piece thing. Also, for those that don’t own a Spanx….you buy your size and when you take it out of the package it looks like it would fit a newborn…and your expected to fit into this TINY thing. I was able to do it, but can you imagine wearing that all day and all night. I’m so ready to not be bound anymore. I’m still having to wear my sports bra and breast band all day/night as well. I can’t wait to be free!! Thank you to all who have been praying for me. This drain pain has about did me in. I didn’t want to post because I didn’t have anything nice to say. lol! I don’t know how people handle chronic pain that never goes away. It is constant and you never get a break. It wears you down and I was starting to think I might have to be institutionalized soon. I was going insane. BUT, in the last 24 hours things have improved. Kevan slept in our bed with me last night for the first time since my surgery. I had to have the bed higher and cannot sleep flat so he’s been sleeping in the guest room. I lowered the bed last night and it actually helped me sleep. I kept waking up and thinking, “Wow, I’m not hurting. What is different?” Once I got up this morning I thought that maybe it was because there was no pulling on the drain line. As I was getting ready to take a shower I forgot to pin my drain to my lanyard on my neck so it fell and pulled on the drain site. It hurt soooooo bad!! I screamed. Kevan and his mom came running asking me what happened. I told them I’m just a baby and everything was okay. lol! Then, I took a band-aid, gave the drain a little slack and then taped it to me. I don’t know why it has taken me a WEEK to think about doing this. But, it hasn’t hurt since. Thank you Lord! I was even taking around the clock hydrocodone and I was still having the pain before the band-aid idea. I didn’t want to take it today since I need to work. Now, when I’m walking around, sitting, moving, etc the drain isn’t pulling all the time because the band-aid is holding it in place. I have relief! Kinda dumb it took me a week to figure out how to stop the pain. Duh! But, I believe it was an answer to prayer. I’m just slow sometimes. I found out bad news today. I cannot have the drain removed tomorrow, like we thought. The fluid has to be less than 5 cc’s for 3 days straight. The last 4 days have been 8, 10, 8 and 9.5cc’s. None are less than 5. It even went up yesterday. Ugh!! Our morning check today was already 5cc. So, today will not make it either. Have I told you how much I HATE DRAINS! I was pretty depressed this morning thinking about having this stupid drain for another week….but I’m feeling a little better now since the pain has subsided. Kevan and I had a good Christmas. We were able to spend it with family and that is all that matters. We read some good advent stories, listened to a few Christmas sermons and thanked God for His Son. Also, my mother-in-law came over and has been cleaning and doing my laundry for 2 days. I don’t know what I’d do without her! I love her!! I also love that my house looks and smells so much better. :o) She is wonderful. Well, there are only a few days left until Christmas. I wasn’t able to go out shopping and the gifts I did purchase online were last minute thoughts. Im not happy with Kevans gift but i hope he will understand. I didn’t prepare enough before my surgery. We were so busy and there just wasn’t enough time. We decided not to put up decorations since I can’t help Kevan lift the tree or boxes of decorations. It would take so much energy to put them out and a few days later I have to put it all away again. Also, I wasn’t able to make cookies this year and the biggest bummer is that my doctor said I am not allowed to cook Christmas dinner. I love cooking and baking. The doctor didn’t want me lifting a ham or pots and pans. Also, i cant do anything repetetive like peeling, cutting and mashing potatoes. I will have to recruit my MIL and Kevan to help with the cooking and we are going with the basics…nothing fancy this year. Also, my in laws will be shocked when they show up on Christmas and my house looks like a tornado hit it. ( this is your warning! ) Kevan has helped me some but he has his own projects outside he is trying to finish up before it gets cold and getting wood ready for the stove. I can’t wait until my restrictions are lifted and I will be able to clean my house! Wow, I can’t believe I just said that. Yes, I would love to be able to clean my house. Lol! I know none of the things above matter because we are celebrating Christ’s birthday. I dont need any of those things to praise and worship my Lord. So, we will do our best to have a Merry Christmas under the current circumstances. I’m happy I’m alive, cancer free and able to enjoy it at all! Praise God for that! I’m thankful that we did have the money to buy the gifts we did even though Kevan is without a job. I know so many struggle with finances this time of year. Also, glad we have the ability to buy online! Don’t have to take a horse or buggy to town. :). Who knows, this might be one of our favorite Christmases because I didn’t get all stressed out over shopping, cookies, dinner, cleaning, etc. If no one trips over the junk all around the house then it will be great! I wish you all a “drain free” Christmas…..which I won’t be having this year! Lol!! Merry Christmas! Last night I was in a lot of pain where my new drain site is and I was “losing it” a little bit. I ended up whining a little too much to Kevan (who was being very patient with me considering!) and then went to bed early because I thought if I could fall asleep I wouldn’t know about the pain anymore. I had been off my pain meds for 2 days, but ended up taking a 1/2 as I went to bed last night. I laid in bed having a little pity party with myself. lol! I was emotional and wanted to cry, but I was able to hold back the tears. I laid there for about 30 minutes and couldn’t fall asleep because it was just hurting/burning too bad. I couldn’t get comfortable and I still can’t lay flat. I prayed and asked the Lord to help me. Then, as I was praying I thought that turning on my iPad, opening the iHeartRadio app and listening to a local Christian station sounded nice. They were playing Christmas music and it really helped my mood and I was able to lay in bed (in the dark) and sing praises to my Lord. :o) I figured that if this was my last night and tomorrow (12-21-2012) was the End of the World…it was good I was falling asleep praising my Lord. HaHa! Then, during commercial segments I heard about a little 2-year-old boy diagnosed with cancer and was in the hospital in Nashville. They were asking for prayer for his family. Then, the next commercial break asked for prayer for a woman that lost her husband and her job recently. I can’t believe I was feeling sorry for myself. Man, I am so blessed. I’m sorry for having my pity party. Things could be so much worse for me. Thank you Lord for showing me. I wanted to mention a recent prayer Kevan and I had. Kevan had to hike through the woods with a neighbor and some people from the state of Tennessee. 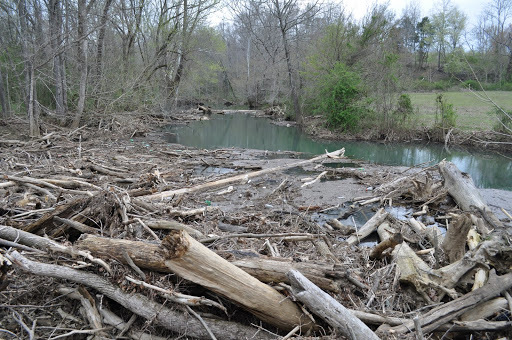 We are trying to get a permit to clean up the dam that has been created in our creek at our bridge. The bridge was built for cars to pass over it, but was only used for a short time (a long time ago) It is 1/2 ours and 1/2 our neighbors. We love our bridge, but we hate that during storms TONS of wood and garbage gets stuck at the bridge causing a dam and the land near the bridge is also being washed away so soon we won’t be able to access the bridge since the water is trying to find an alternate route. Also, it floods our land and our neighbors land due to the dam. Here is a picture of the debris that piles up. Anyway, while Kevan was hiking to it he ended up losing his smart phone. He was devastated. Once he got home we prayed together and then he headed out to find it. I tried calling it when he would radio me to do so, but he never heard it ringing. Sometimes we don’t have a signal on our property. He came home without a phone. I encouraged him to go out one more time before it got dark to search again because it was supposed to rain the next day. We prayed, our mothers prayed and a friend that had stopped by also prayed with us. He was gone about an hour and still had not found his phone. Our neighbor, Mr. B, stopped by the next morning, knowing Kevan had lost his phone and offered to help Kevan search for it. Mr. B is in his 70’s and he hiked the woods with Kevan searching for his phone. He is such a sweet man. They searched for about an hour and Kevan started to pray and ask the Lord why He wasn’t answering his prayer. That so many had prayed and he just didn’t understand why God wasn’t answering this simple prayer. During his prayer he heard the Lord say, “Did you ask your neighbor if he prayed? Did you pray with him?” He hadn’t. So, he found Mr. B resting on a log. He asked him if they could pray about it together. After they finished praying the phone was found within 5 minutes. Praise the Lord! It was found in an area Kevan had already passed 3 times and each time he hadn’t found it. We were so thankful that we could celebrate this answer to prayer and that it had a sweet story…so I wanted to share it with you. Also, it had rained a little bit that morning, but his phone is working fine. :o) Oh, and we are still waiting to hear about the permit for the bridge clean-up. New word: Seroma – a lump or swelling caused by an accumulation of serum within a tissue or organ. First, thank you to those that prayed for me. I felt better today when I woke up (probably due to the antibiotics they started me on – Cipro and Bactrim) and I prayed that when we arrived at the doctor that Kevan and I would just look like paranoid idiots and that there really wouldn’t be an issue. I would much rather look like an idiot than have an infection or seroma. I did not have a fever this morning and my right breast didn’t look as red. So, it seemed that maybe everything was fine. We packed the car with overnight clothes/items just in case. If it was serious I may need to stay at the hospital or if we had to see the doctor again tomorrow we could just stay at my MIL’s instead of making the long drive two days in a row. We arrived 30 minutes early. We had given ourselves the normal 2 hour drive, but traffic was down so we arrived early. We finished listening to a Christmas Sermon by John MacArthur and then headed in to see if they could take us a little early. Kevan and I love the modern technology. We have been listening to YouTube videos or streaming sermons lately during our long drives. It is pretty cool that our cell service is able to stay connected well enough that the video/audio is never interrupted and it gives us so many more options than just listening to the radio. When we arrived my two wonderful nurses, Miss L and Miss B, took a look at the redness and didn’t notice any swelling. They didn’t think anything serious was going on, but wanted to make sure with Dr. M’s confirmation. So, Kevan and I waited (he was in surgery) until we could see him. We just played around on our phones for 30 minutes and the time went by pretty fast. :o) I was very happy though…thinking that nothing was wrong and I’d be going home. Dr. M came in and in the next 5 minutes he burst my bubble of happiness. He immediately mentioned needle and drain. I obviously got emotional because I hate both words. He could tell I was getting emotional, but he knew that putting in a drain if he found fluid (seroma) was the right thing to do. I already have potential issues because I’ve had 3 lymph nodes removed from that side and it is my cancer side so there was more trauma to the area during surgeries. Of course, I wanted what was best, but I didn’t want to go through anything else so I was starting to cry a little just thinking about it. Miss L and Miss B prepped the room for my “minor” surgery. I was so glad they were going to let Kevan stay. He moved his chair to the other side of me, held my hand and prayed for me. Then, Dr. M stuck a few needles in me to numb the area (OUCH!!!) and then did the procedure to find any fluid that was there. I felt a lot of pressure and some “jamming” which I did not care for. lol! I didn’t watch, but looked at Kevan the whole time. At one point he had a weird expression on his face that scared me so I told him he wasn’t allowed to watch if he was going to make faces that scare me. lol! So, then he just continued to watch, but put his hand over his mouth so I couldn’t read him. Anyway, there was quite a bit of fluid so Dr. M did need to put in a drain. Have I told you how much I HATE DRAINS! Ugh! I am grateful for them, of course, because they have a great purpose, but I just don’t like this thing stuck in my body that has a big long tube that gross stuff drains through to get to a “bulb” that we have to empty 3 times a day. Dr. M also noticed a blister that had formed and lanced it (ouch!). For those that are brave and can look at medical stuff…I’ve uploaded a picture of what the blister and drain site looks like. It isn’t pretty! So, click here to see a picture. I made the picture really small because it just looks grotesque looking at it any bigger. I will have to have the drain until the fluid coming out is less than 5cc’s for 3 days. Last Monday, they removed my drains and the count had to be less than 20cc for 2 days. So, you can see that the threshold has to be a lot less now. My appointment to have it removed is next Thursday, but if it is more than 5cc’s I will have to move it. I am praying it is next Thursday! It is funny that the whole time I was laying on the table going through this, in my mind, I was thinking……”I want a big piece of Gondola’s cake for having to go through this”. LOL!!! I’ve fallen off the diet wagon and have cheated a few times lately. If we had driven past it on the way home I would’ve made Kevan go buy me a piece of cake. :p I love their cake and I think it would’ve made me feel a little better. LOL! Finally, I want to say how wonderful my husband was to sit there and hold my hand the whole time and to pray with me. I am so thankful for him and his support. People tell me I am such a strong person all the time, but I have so much support (Kevan, Family, Friends, God) and that is how I’m able to be strong. After each of the things I go through I appreciate so much more what my mother-in-law, Judy, went through. She has had breast cancer twice. She is a single woman. I don’t know how she did it. Kevan went to her appointments with her and tried to help her, but he wasn’t there for her first cancer experience because he lived in Texas. Also, he couldn’t help her, like he does me, because that is just weird….cuz she’s his mom. Ha! Anyway, Judy….you are the strongest woman I know. I don’t know how you did it. I love you so much. I wish I would’ve known you then so I could’ve helped you through each thing. I’m glad God was with you though and got you through it. I can’t imagine my life without you in it. I ran a fever throughout the night and still have one today. It ranges from 100 to 101.5. My headache is a lot better today and most of the day I haven’t had a headache. When I got into the shower this morning Kevan and I noticed that my right breast was red and hot to the touch. The left one looks normal and is not hot. Also, I have no pain on the left side and still have a lot of pain on the right (if I touch it or move my arm at all). I called the doctor to let them know about it. I believe that this is a sign of infection. They prescribed me two new antibiotics and want to see me at 10am tomorrow. Please please please pray there is no infection and that Kevan and I are just paranoid. Thank you for your prayers. I need to ask for prayer. Last week I received a call from a woman that was connected with the hospital where I had my surgery. She informed me that they do random testing of drugs and that they tested a drug that was also used by my anesthesiologist and it came back positive for yeast. I have no idea what this means, but she said I needed to contact them if I experienced a headache and fever. I’ve been doing really well, but yesterday I started feeling like I was getting sick. I’ve had a headache since yesterday afternoon….it is soooo bad. I keep laying down to take a nap to see if it will improve. My fever is 100.7. The woman did not leave me with a number to call back and when I call back the caller id number no one answers and there is no voice mail. I called my doctor, but they are not sure who I need to contact since it is a Centennial Hospital thing and not related to my surgery. I know that it is highly unlikely that this is connected. That would just be very odd. But, I am scared it might be since I never have fevers (except after chemo). Please pray there is no connection and that my symptoms will subside. Thank you! I’ve also prayed and Kevan prayed over me as well. Update: I spoke with the anesthesiologist. He confirmed that they had to notify everyone that has had surgery during the time the drug was used and confirmed that it was found to contain a contaminant. They believe it was a false positive so I don’t have anything to worry about, but he is only 99% sure. There is still the 1%. This doesn’t make me feel good since they told me there was only a 2% chance that my lump was cancer! Anyway, if I am still sick and running a fever tomorrow we have to drive all the way into Nashville again tomorrow to go to the ER. I’m already listed as a potential person for it and they will just run a blood test called an Antigen test to confirm. I also have to call a hotline if my headache gets worse, but it is already pretty bad. He thinks I may have the flu. :(. Thanks for your prayers. What a difference a week makes! Or 8 months. I am a week and 2 days out from my final reconstruction surgery. The swelling is gone, the pain is getting better, the stitches have been removed and things are looking good. I wanted to write a post to encourage those women that have to go through the same procedures. The journey is hard, painful, stressful, discouraging, sad…..but in the end….it is worth it. I have talked on this blog many times about the pain and internal turmoil I experienced the first time I saw myself after my double mastectomy and how it took weeks…maybe even months for me to look at myself without crying. Sometimes crying the whole remainder of the day. It was hard to experience and hard to believe that I would ever look normal again. God was with me though and I prayed and prayed that the doctors and my husband would be right. That I would be able to look at myself and be okay with it. That God would answer my prayer and I would look normal again. I know a lot of you prayed as well. I am here as a witness now to say, “I look pretty darn good!”. God answered those prayers! 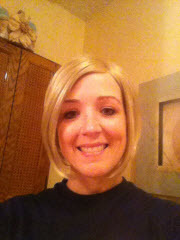 In some ways, I look better than I did before I had breast cancer. I am very happy with the results. The surgeon was able to use new technologies to do so much…it is pretty unbelievable. I still have a lot of healing left, but things should improve week by week. My scars will eventually fade and as far as I can tell….no one would ever know I have breast implants under this skin. The implants we chose look so natural. I didn’t want to look fake and I don’t. Praise God! The tissue expanders felt like rocks….the implants feel so much better. They took the sutures/stitches out yesterday so those areas still need healing and I still have dissolving stitches all along the bottom of my breasts, but I have joy today. I can see now what the doctor and my husband kept telling me in the beginning. I would look normal again and I would be happy with it. I am. I am grateful to God for blessing me so much. I am so so so grateful that my husband is excited and very happy as well at how things are looking. lol! As a married woman, this means more to me than my own acceptance of myself. But, to have both (mine and my husband’s joy in it) and not having to feel like I “look as good as can be expected after breast cancer”…..but I “look good” and believe I will look great in weeks to come is huge to me….this is HUGE to me. God’s grace. God’s love for me. It overwhelms me. How I look shouldn’t matter. I know this. Who really sees me anyway besides myself and my husband? But, it matters. It matters that I feel beautiful for my husband. It would matter even if I was a single woman. It matters that underneath it all I’m not left with the memory of the horror of it every time I see myself without clothes, but instead the beauty of what God has done for me. He brought me through a very hard time and left me better than I was before. Not just on the outside, but also on the inside. Only my Lord can do something this powerful. Oh, how I love Him. I know it mattered to my Father because it mattered to me. He doesn’t do things small…..He delivers BIG. He is the Creator of the world….why couldn’t He make me look great again? Of course He can! He made man from the dust of the earth….He spoke the world into being. He healed me from cancer, He walked with me through it all, He gave me strength to endure it and HE gives me this joy today. I am so thankful and blessed. This song….is so fitting for my heart today and for the season – UNSPEAKABLE JOY! I did so well yesterday that I decided to cut back on my pain meds and did a little more than I had been doing (putting dishes in the dishwasher, worked on my laptop, etc). I thought I was doing great. At about 10pm I had Kevan help me into bed and gave me my nightly hydrocodone. Then, 30 minutes later I called him on the Wilkie Talkie and begged for a Valium. I was in so much pain I was crying. Kevan gave it to me and we waited 30 minutes to see if it was going to get better. It didn’t. By then, I was bawling I was in so much pain. I kept telling him I felt like I had been shot. Lol! Not sure why, since I’ve never been shot and don’t know what it feels like. Anyway, Kevan helped me to the bathroom and then he unwrapped my chest. The pain immediately subsided. Then, he rewrapped me and helped me back to bed. We figured maybe I was wrapped too tight. But, within an hour it all started again. If I laid down I was in extreme pain and if I sat up or walked around it was better. I went back to bed, raised the back of our adjustable foundation as comfortable as I could and then tried to sleep through the pain. I haven’t had any more tears but it sure was painful. I got up this morning on my own because I didn’t want to wake Kevan. This was also stupid because I felt the stitches in my stomach pull as I tried to get up. I called the doctor’s office this morning and asked them what could be happening. They think I did too much yesterday because my pain wasn’t as bad and one of my stitches tore something. I am right handed so it makes sense. Also, I lifted my laptop and used my laptop for the first time last night so that could’ve pulled something. I’m not supposed to lift more than 5 pounds and I’m pretty sure my laptop is at least 10 pounds. That is what I get for trying to work when I’m supposed to be off. Bad Jayde! I am very groggy today. I’m guessing from lack of sleep. So, I’m off to try to take a painless nap. The last two days have been better days. I was pretty sad on days 3 and 4 wondering how I was going to make it through this recovery because the pain was so bad, but I’m doing better now. I’m grateful for Kevan and Judy (my mother-in-law). Judy let us stay with her in Nashville the first 2 days and then she came and stayed with us the next 2 days. She just went home yesterday. I don’t know what I would’ve done without them. They made sure I was given my pain meds every 4 hours. Judy set an alarm at night and got out of bed just to make sure I was getting what I need. She also had to help me up so I could go to the bathroom. I am so grateful. Thank you Judy. Also, thank you for all you did with cleaning my house, doing laundry and everything else you did for us. I didn’t post earlier because I hate typing on my phone and my laptop is just too heavy for me to lift so I have to wait for Kevan. Kevan helped me get it all hooked up tonight. The first day home I was able to lift myself, but it has been too hard ever since. Not sure if the anesthesia had not worn off yet or if I’m just so sore now that I can’t make myself do it. I’m not allowed to use my arms to help myself up so it is really hard when you are so sore to lift yourself if you can’t use your arms. Kevan has helped me take a few showers. It went well and felt good. Much easier than after the mastectomy. I was able to stand the whole time and I hung my drains on a hanger that hung on the curtain rod. I am not allowed to let the water hit my chest directly so I have to stand with my back to the water and let it drip toward the front. It still feels good. Also, it was several weeks before I could wash my own hair after the mastectomy (I think) because I couldn’t lift my arms that high. But, I washed my own hair with no problems or pain. I’m not allowed to scrub because there are steri-strips or adhesive strips over my sutures. So, I just kind of squeeze the soapy water over me and then let the clean water go over that. After I get out of the shower I have a lot of pain in the top of my breasts (where the sutures are through the muscle). I’m pretty sure it is muscle pain so I take a Valium and it really helps with the muscle spasms. Kevan took some pictures of me today just so we can see the progress and I look like I’ve been in a terrible accident or was beat up pretty bad. lol! I can’t wait until a couple weeks from now so I can see what it will look like without all the bruising and sutures sticking out. Also, my stomach is VERY swollen still. I had some liposuction for the fat grafting and it looks bigger than it was before surgery. My bruising from the liposuction (for fat grafting) seems to be getting better. It still REALLY hurts on my hips though. Most of my pain is from the sutures at the top of the breasts and the where the drains come out. It is very red and sore where the drains are. I can’t wait to have them removed on Thursday. Praying that I won’t have much fluid draining the next two days so I can have them removed. I’ve been trying to do my exercises between 3 and 5 times per day. I’m doing a lot better than I was last time. I’m hoping that I won’t have any scar banding this time and won’t require physical therapy. I’m tiring of the wraps over my stomach and breasts. I cannot wait until I only have to wear them at night, but it won’t be until the 3rd week (I think). I was going to post some pictures of my bruising and sutures, but I am just not that brave. After I looked at them they just looked so bad I didn’t want to subject you guys to it. lol! Plus, it might scare those that have to go through this themselves. Thank you everyone for your prayers and big thank you to my church for setting up meals for us. It lets Kevan stay home with me and not have to leave to figure out meals. I’m trying to wean off my pain meds so I can start reading my bible again. I can’t read when on them since everything is doubled or jumbled together. Hopefully, tomorrow will be an even better day. Love you all! God is good!